The 32 runs through the heart of Staffordshire from the Potteries to the Moorlands. The full route is hourly Mon-Sat daytimes, with additional journeys running for part of the route. It's operated by First Potteries. 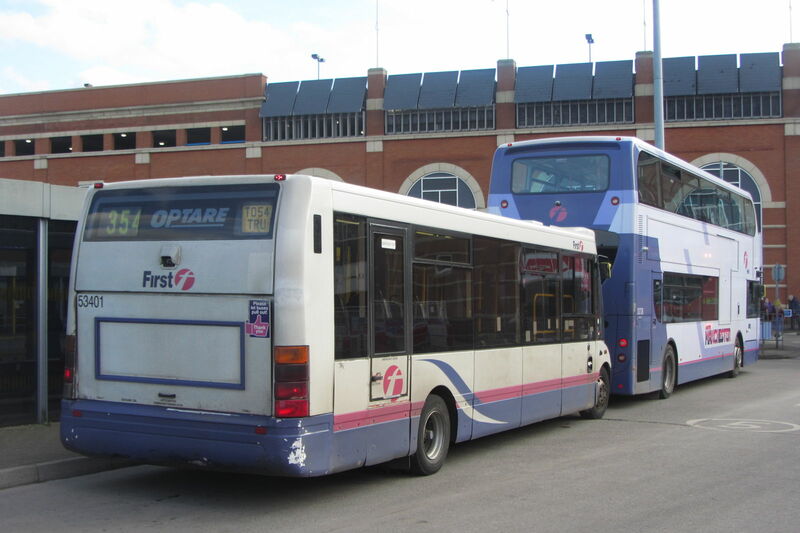 The cheapest day ticket valid throughout the full length of the route is the FirstDay Network at £5.50, which is valid valid throughout route 32 and all routes operated by First Potteries. The FirstDay Potteries ticket at £4.00 is valid on the 32 from Hanley Bus Station as far as Cellarhead Crossroads. It's valid for a day on all First buses in their Potteries zone. If you're travelling beyond Cellarhead, then you need the FirstDay Network at £5.50, which is valid valid throughout route 32 and all routes operated by First Potteries. If you need to use routes operated by other companies and won't need to go east of Cellarhead Crossroads on the 32, then the multi-operator Smart Day Ticket at £5.30 is for you. It's valid all day in this zone on all buses operated by First, Arriva, D&G, Scraggs and Stanton's. Stoke Plusbus tickets, bought with train tickets to or from Stoke-on-Trent, are valid on the 32 from Hanley Bus Station as far as Cellarhead Crossroads. The 32 starts from Stand E at Hanley Bus Station. A short bus ride away is Stoke-on-Trent Railway Station. Click here for details and here for live departures. Buses towards Uttoxeter use stop O1 on Old Hall Street, just outside The Money Shop. Buses arriving in Hanley drop you off at Potteries Way on the A5008 Bucknall New Road, before proceeding to the Bus Station. Buses towards Uttoxeter stop on the right, buses to Hanley on the left on A5008 Bucknall New Road. Somerset Road, which leads towards the entrance to Northwood Stadium, is on the right. Buses towards Uttoxeter stop on the left and buses to Hanley stop on the right on A52 Bucknall Road. Buses towards Uttoxeter stop on the right, buses to Hanley on the left on A52 Werrington Road. Buses towards Uttoxeter stop in the distance on the right, buses to Hanley on the left on A52 Werrington Road. The Co-op is now an Asda Supermarket. Buses towards Uttoxeter stop on the right, buses to Stoke on the left on A52 Ash Bank Road. Buses to Uttoxeter stop on the right, to Stoke on the left on A52 Ash Bank Road. Buses towards Uttoxeter stop on the right, to Stoke on the left on A52 Ash Bank Road. Buses to Uttoxeter stop on the left in the far distance, buses to Stoke on the right on A52 Ash Bank Road. Buses towards Uttoxeter stop here on A52 Kingsley Road, with the crossroads in the distance. Buses to Stoke stop here on A52 Cellarhead Road, again with the crossroads in the distance. The 16 follows the same route as the 32 between here and Hanley Bus Station, giving you a more frequent service on this section of route. It is operated by D&G however, not First, so if you want to use both services, you'll need a multi-operator ticket. The FirstDay Potteries ticket at £4.00 is valid on the 32 from Hanley Bus Station as far as Cellarhead Crossroads but no further. It's valid for a day on all First buses in their Potteries zone. If you're travelling east of Cellarhead, then you need the FirstDay Network at £5.50, which is valid valid throughout route 32 and all routes operated by First Potteries. Stoke Plusbus tickets, bought with train tickets to or from Stoke-on-Trent, are valid on the 32 from Hanley Bus Station as far as Cellarhead Crossroads but no further. Buses to Uttoxeter stop on the left in the distance, buses to Stoke on the right on A52 Leek Road. Buses to Uttoxeter stop on the right, buses to Stoke on the left on A52 Leek Road. Buses to Uttoxeter stop on the left, buses to Stoke on the right on A522 Leek Road. The town centre is in the distance. The buses run a one-way loop in central Cheadle, with services in both directions stopping here on A521 Chapel Street. The main stop for buses towards Stoke is this one near the Royal Oak Hotel on A521 High Street. For buses towards Uttoxeter, walk a bit further northeast along the High Street to this stop by the Natwest Bank. Buses to Uttoxeter stop on the right, buses to Stoke in the distance on the left on A522 Tean Road. Buses to Uttoxeter stop here by the car park of The Ship pub, while buses to Stoke stop opposite and a bit further north at the Water Works on A522 Cheadle Road. Buses to Uttoxeter stop on the right, to Stoke on the left on A522 High Street. Buses to Uttoxeter stop on the left, to Stoke on the right on A522 Uttoxeter Road. Buses to Uttoxeter stop on the left in the distance, to Stoke on the right on A522 Uttoxeter Road. Buses to Uttoxeter stop on the right, to Stoke on the left on the A522. Buses to Stoke stop at the brick shelter next to Spar on the left on B5030 Ashbourne Road. Buses to Stoke stop by the entrance to the Fox's biscuit factory. The 32 terminates at Stand 4 of Uttoxeter Bus Station, at the northern end of the town centre. The FirstDay Network ticket at £5.50 is valid valid throughout route 32 and all routes operated by First Potteries.